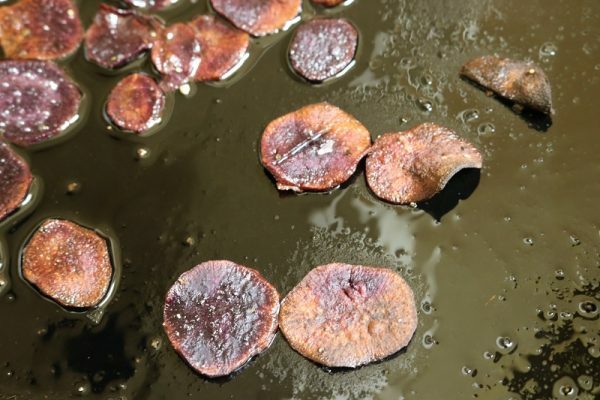 Crispy, crunchy, slightly sweet – these purple sweet potato chips are just the thing to keep the snack monsters at bay. They’re super-easy to make (as long as you keep an eye on them in the oven) and last forever in an air-tight tin in your pantry. 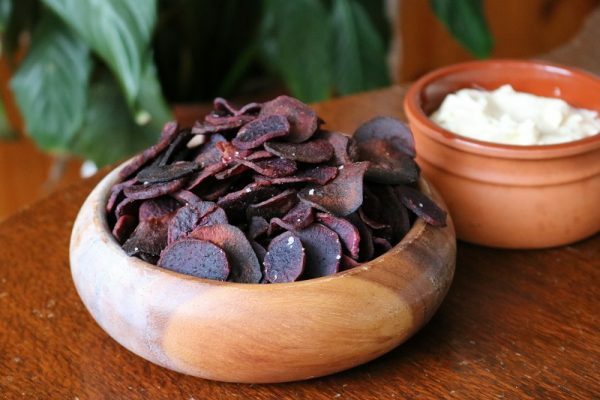 Purple sweet potato chips are so easy to make, and even better to eat! Peel your sweet potatoes and pre-heat your oven to 220C. Slice the potatoes as thinly as you can - a mandoline is ideal if you have one. Divide the sweet potatoes across two large baking sheets and drizzle liberally and we mean liberally!) with the oil. You want the slices, to be totally covered and then some. Sprinkle with some of the sea salt. Bake in the oven, checking regularly, until the slices are crisp. Remove the crisp ones as you go, leaving the rest to cook. The cooked ones will start to look a little orange, and will be hard when you tap them. Sprinkle the removed ones with sea salt as they come out of the oven. Swap the baking around about halfway through so the potatoes cook evenly.